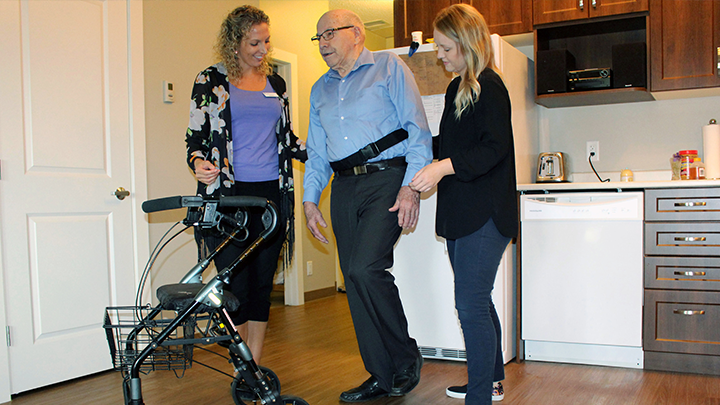 Physiotherapist Jessica Richardson, left, and physio assistant Madison Soderquist, right, do a balance check with hip-fracture patient Frank Shultz during a session in his home in Grande Prairie. It’s all part of the AHS Hip Fracture Home-Based Rehabilitation Program. GRANDE PRAIRIE — With a grin on his face, Frank Shultz stands in his kitchen and balances on one foot. “Looking good,” says Alberta Health Services (AHS) physiotherapist Jessica Richardson, as she checks his form with physiotherapy assistant Madison Soderquist. It’s been six weeks since he fractured his hip in a fall while trimming trees — and today the 85-year-old is making great strides through the AHS Hip Fracture Home-Based Rehabilitation Program, which launched here in the fall of 2016. “It’s about rehabilitation to restore function, but also to prevent future fractures,” says Leana DeJager, Allied Health Manager in Grande Prairie. The home-based aspect is key — the physio team works with clients directly in their homes — whether that is a house, a condo, a lodge or a continuing care centre. Generally discharged from hospital within five to seven days after a hip fracture, patients start physiotherapy immediately in hospital and continue at home very soon after discharge. “We’re doing one to three intensive sessions a week with each client,” says Richardson, noting they work closely with the acute care teams in the hospital. The Hip Fracture Home-Based Rehab program falls within the AHS Bone and Joint Health Strategic Clinical Network provincial Fragility & Stability program. It’s also supported by the Alberta Bone and Joint Health Institute. At present, there’s no waitlist for the program, which provides service within 100 km of Grande Prairie. Statistics show that for the year 2017-2018 there were 2,843 hip fractures in Alberta. Six per cent of those re-fractured within one year and required hospitalization, while 86 per cent returned to their previous living environment. Stephenson says the program has made a significant difference in helping people who, in the past, may not have been able to access or receive physiotherapy. “Sometimes, with a hip fracture they don’t reach out to the community physio, particularly in rural areas where you have to get in a car and drive for miles to get to an appointment,” she says, noting that having physiotherapists go to the patients is having a positive impact. “I think this program has also opened the whole community’s eyes to the effectiveness of physiotherapy,” she adds. For Shultz, the program has indeed been eye-opening, particularly as he recalls a back surgery he underwent with no follow-up physio. With its client-centred and goal-driven approach, the program gives clients a better quality of life and significantly reduces the odds of elderly patients having to be placed in care — or into a higher level of care — following a hip fracture, says notes DeJager.